There’s a whole host of Google apps that people use on a daily basis, like Chrome, Gmail, Drive, and so on. But Google Fit hasn’t really caught on like that. In an effort to improve its Android heath and fitness app, Google has basically redesigned Fit to better support people’s activity and wellness goals. To start, Google says it turned to both the American Heart Association and the World Health Organisation in order to develop two activity goals: Move Minutes and Heart Points. Like the name implies, Move Minutes is a simple stat that tracks how often you walk around, with the goal of encouraging people to move more and sit less. Meanwhile, Heart Points tracks how often you raise your heart rate and then awards you points — one minute of moderate exercise is worth one point, while more intense activities like swimming or boxing will accrue double the points. The two stats combined look a bit like the Apple Watch’s activity rings — swapping out a step-count goal for something that functions like a game. For easily identified activities like walking or biking, Google says Fit can automatically track your activity. However, for other stuff, Google says the app has also been upgraded with data on more than 120 other activities in hopes of enabling the service to gather more accurate fitness data. But potentially the best part about Google Fit is that it will also share data with other major fitness apps, including Strava, My Fitness Pal, Runkeeper, and Endomodo, while also pulling in new data from a supported Wear OS smartwatch, which could help prevent your apps from needing to fight over your wellness stats. Finally, to help ensure that people don’t fall off the wagon, the Fit app also includes a coaching function with customised tips on how to earn more Heart Points and how to set and adjust goals for people who want to increase their fitness over time. Honestly, these changes make a lot of sense, because by gamifying health and fitness, there’s a much better chance Google will be able to keep people conscious and invested in their health and well being. 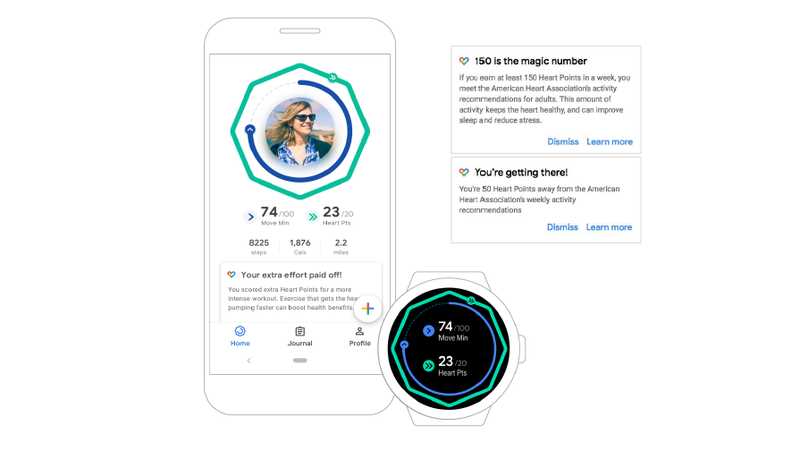 And what’s more, with its enhanced integration with Wear OS, the new Fit app adds more weight to the rumours that we’re going to see Google release some kind of Pixel watch later this fall alongside new phones and potentially other devices. The update for Fit should roll out sometime over the next week.